Located in the heart of Saalbach, the 4* Superior Hotel Eva Village has a great reputation for its food, an impressive pool and spa area and designer rooms. The nearest ski lift is around 100 metres from the Hotel and the shops, bars, cafes and restaurants of Saalbach are on the doorstep. Some flexible and shorter stays are available outside of the high season. 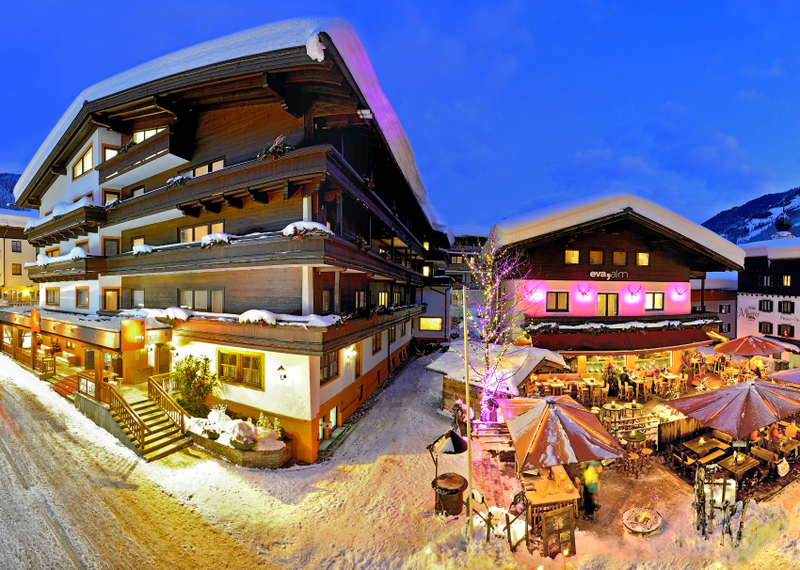 The hotel has a spacious lobby reception area, breakfast and dining room, hotel bar, lounge, lift, conservatory, ski and boot room, large sun terrace and ‘Eva-Alm’ après-ski bar next to the Hotel. The Hotel is non-smoking throughout. Free WiFi. Wellness facilities are extensive (800 m2) and include the Eva-Beauty Spa with 10-metre indoor lagoon pool, Jacuzzi, relaxation area with water beds, steam room and saunas. There is a tea and fruit bar and beauty and massage treatments are available subject to a local charge. Opening times as posted locally. All rooms are individually designed and ensuite with bath/shower, WC, balcony, safe, hairdryer, telephone, TV and free WiFi. 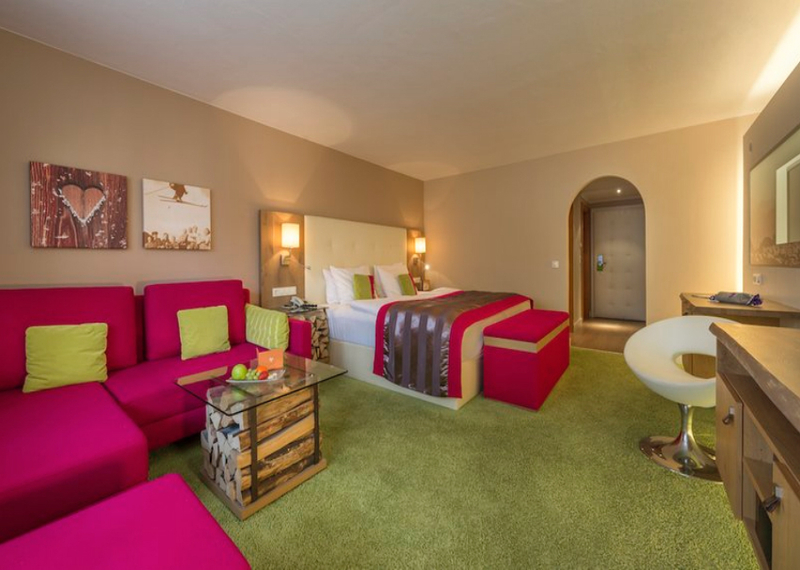 Minibar is payable locally and bathrobes and slippers are available free of charge. Standard rooms (20 m2) are Double / Austrian Twin ‘Thommy’ type. Larger 2-3 bedded rooms (28 m2) offer more living space and the option of a third bed (‘Chance’ type, 3rd image down) and ‘Cristalle’ Junior Suites (top right image) offer around 43 m2 of space including a sitting area. Please note all rooms are non-smoking. Accommodation is on a half board basis including an extensive hot and cold breakfast buffet and four course evening meal with a choice of main course, daily salad buffet and weekly starter or dessert buffet. 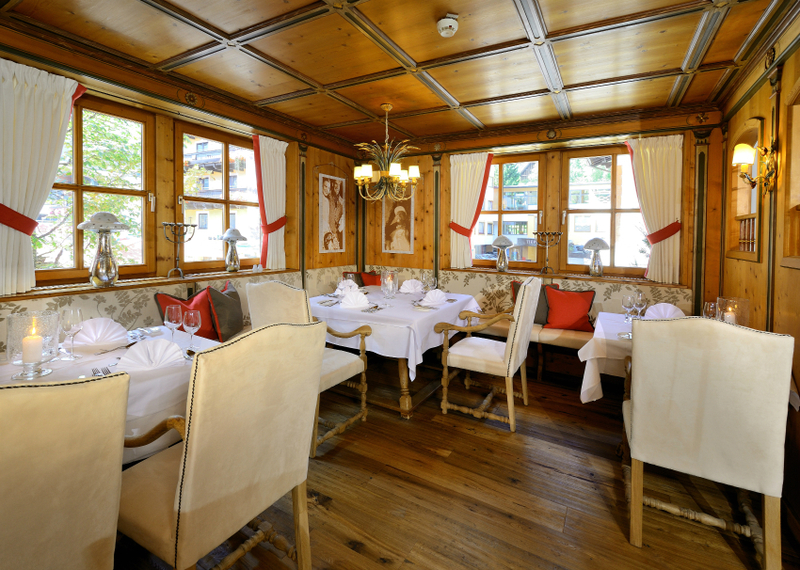 An afternoon skier’s snack and Christmas and New Year’s Eve Gala Dinners are also included in our prices. Enjoying a great location in the heart of Saalbach with a short walk to the lifts and pistes, the Hotel boasts individually designed rooms, a superb Spa and Wellness area and has an excellent reputation for its service and cuisine.